Combines an appetizer plate and a cup holder into one product! 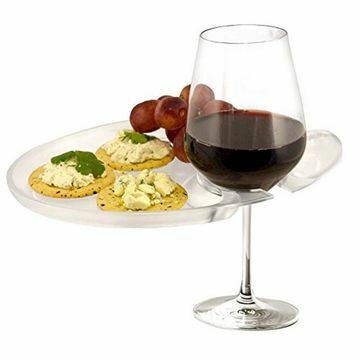 The Wine 'N Dine Party Plate is a convenient and attractive solution for simultaneously carrying a wine Glass and sampling hors d'oeuvres. Easily greet friends and nibble on appetizers while holding a glass of wine using this innovative party plate.